Parce Rum partner and Cordillera resident, Brian Powers, center right, joins Parce's master rum blender, Brojen Fernandez Domecq, center left, Ti Amo restaurant owner Steve Negler, right, and mixologist Mark Summers, left, for a night of Parce Rum cocktail tasting at The Rose in Edwards earlier this month. This week Eagle Country resident Brian Powers launches Parce Rum in Vail. Look for it at Riverwalk Wine & Spirits, Avon Liquors and West Vail Liquors as well as selected restaurants including Matsuhisa, Ti Amo and The Rose. Parce Rum will also be featured at this year’s EdFest, Aug. 16 at the Fields at WECMRD in Edwards. Visit www.parcerum.com to learn more. Serve stirred, up or on the rocks. Garnish with a real Maraschino cherry. Rum is possibly the most storied spirit on the planet. Made from sugar cane, which grows around the world, rum has been distilled for hundreds of years, likely since the 1600s. Rum distilleries actually existed in the U.S. long before whiskey or gin was ever made. It more commonly lends itself toward sweet island-inspired cocktails that conjure up images of pirates, parrots, beaches and bikinis. However, when Cordillera resident Brian Powers and his two brothers decided to bottle their Colombian experience, they had a very different rum in mind. Four years in the making, that idea comes to fruition this week with the Vail launch of Parce Rum. The story of Parce Rum begins, though, with an Irish American family from Chicago and their connection to a country and culture through business and family. It is the story of how three brothers were so inspired by the beauty and hospitality of the country that they decided, in honor of their late father, to create a high-end, authentically Colombian sipping rum. Colombia is more commonly associated with cocaine, drug lords and civil war than high-end rum. However, for the Powers family, the country offered a much different personal experience. They were initially introduced to the country in the early 1990s when younger brother Patrick headed there to scout out opportunities to expand the family’s water, oil and gas pipeline business. Three months after their father died of cancer in 2010, the brothers met at Pat’s finca (a Colombian farmhouse), 35 miles southwest of Medellin, to mourn the loss of their dad and celebrate his life. Sitting on the veranda, they took in the expansive views of the Cuaca River Valley while sipping Colombian rum and telling stories about their dad. It was there the three brothers had a moment of divine inspiration, Brian said. “We need to bottle this experience,” Brian said. “We need to bottle the Colombian experience in honor of our father,” they agreed. 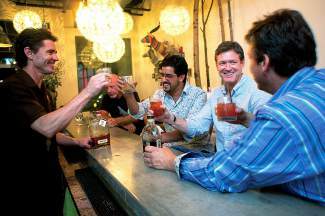 Since they knew nothing about making rum, they turned to their Colombian business partner, Jaime Uribe, who connected the brothers with Colombian father-and-son duo Arthur and Brojen Fernandes Domecq. Rum is typically enjoyed either neat or on the rocks in Colombia so it was important that the rum also be able to stand on its own legs rather than as a mixing liquor. The 12-year rum is medium to full bodied with flavors of toffee, dried fruits, brown sugar and vanilla rounded off with a smooth mocha, nut and pipe tobacco accent finish. There are lingering notes of coffee, cocoa and leather that all lend themselves to the Colombian lifestyle. The 8-year vintage offers a more playful version of the rum, with flavors of candied fruits and cherries, hints of vanilla with a light easy body and a smooth finish. “These rums have been blended and aged in coffee country in Colombia, evoking the rolling hills and luscious green country side. This aging is done at the foothills of some of the highest mountains in Colombia,” Brojen Fernandes Domecq said. Both vintages are aged in charred American oak Jack Daniels barrels, giving the alcohol a single malt scotch or whiskey sensibility. For Mark Summers, mixologist at The Rose in Edwards, this is what makes Parce unique. For Brian, who has called the Vail Valley home since 2010, it was important that Vail not only be one of the launching pads for the product but that the community also take some ownership of it. Powers has received a great deal of support for Parce Rum from the Vail community. As a high-end resort town, Vail prides itself on offering not only premium products but also a premium experience. To help facilitate the relationship between Parce and Vail, Brian enlisted the expertise of Summers and Steve Negler, owner of Ti Amo restaurant in Eagle-Vail, as experienced professionals in the Vail hospitality scene. Neither Negler or Summers had ever been to Colombia before, so neither understood exactly what Brian was trying to bottle. Until this spring. In late May, Brian accompanied the two to Colombia to introduce them to the culture behind Parce. During a long, eventful weekend where they enjoyed the surprisingly hip, cosmopolitan city of Medellin as well as the relaxing beauty of the countryside at Pat’s finca, both developed a new appreciation for both Colombia and rum. For Negler, Parce summed up Colombia for him. Dominique Taylor is a freelance photographer and writer based in the Vail Valley. For more information contact her at taylordmedia@icloud.com, visit http://www.dominiquetaylor.com or follow her @taylordmedia8.